I write this letter to introduce you to the meaningful work that the Teach Them To Fish Foundation by building primary schools in rural Cambodia and Uganda and the global impact our work has on the lives of thousands of orphaned and underprivileged children and girls at risk for human trafficking who without your help simply would have no hope. We incorporated the Teach Them To Fish Foundation on December 28, 2006, in the Commonwealth of Virginia. On March 12, 2007, the Internal Revenue Service issued an Determination Letter reading in pertinent part: “… we have determined that you are exempt from Federal income tax under section 501(c)(3) of the Internal Revenue Code. Contributions to you are deductible under section 170 of the Code. You are also qualified to receive tax deductible bequests, devises, transfer or gifts under section 2055, 2106 and 2522 of the Code.” Later, we petitioned to the Commonwealth of Virginia for a Virginia Retail Sales and Use Tax Certification Exemption. 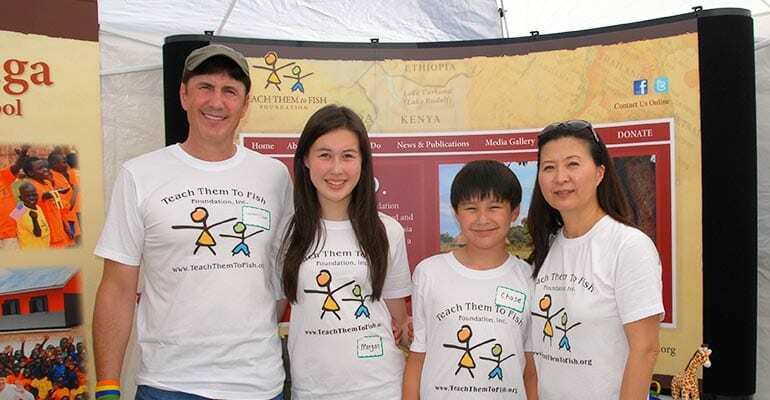 The Teach Them To Fish Foundation, as an all-volunteer §501(c)(3) international economic development non-profit charity, is governed by a Board of Trustees. Our mission is to do our share to alleviate the unimaginable human suffering caused by extreme poverty and hunger in the developing world where over 75% of the population lives on less than two dollars ($2.00) a day and more than 69 million children do not have schools to attend, by building primary schools for children in rural Cambodia and Uganda and emphasizing the importance of educating girls at risk for human trafficking. As we built our first three primary schools, and gained practical field experiences, we became acutely aware that girls were being denied the opportunity to study. Less than one in nine girls who entered first grade continued to the seventh grade compared to one in three boys. While we were able to remove obvious gender inequalities such as building separate boys’ and girls’ toilet facilities and providing sanitary napkins for girls, cultural practices hindered the girls. For example in rural Uganda, tribal preferences favor educating boys. Parents argued that even though admission to school is free, education is not free. If girls go to school, they cannot work in the fields. Parents often force their daughters to marry at the ages of eleven or twelve, but certainly not much later than thirteen. It became clear. We needed to confront these additional issues methodically. According to the United Nations, just one year’s education for a girl reduces infant mortality by 5% to 10%. Our initial plan involved call-in radio talk shows and town-hall styled meetings with villagers. Yet, girls’ parents remained apathetic. It was in response to this concern that, in 2013, we collaborated with the Georgetown University Law Center, Leadership and Advocacy for Women in Africa Fellowship Program to help educate women’s rights lawyers from various countries in the continent of Africa (including Uganda) who after one year of study at Georgetown receive a Master of Laws degrees and return home to their countries to advocate for the status of women including advocating for equal education opportunities for girls. In Cambodia, we have implemented an Aspiring Girl program whereby the foundation will pay families five dollars ($5.00) to ten dollars ($10.00) a month if their daughters have perfect school attendance. In addition, we have implemented Life For Orphans program whereby donors can sponsor an orphan for fifty dollars ($50.00) a month, or six hundred dollars ($600.00) a year, which will cover the cost of the orphan’s food, clothing, school supplies, and routine medical costs. While the Teach Them To Fish Foundation is not first-responders, we maintain a Save The Children program and stand ready to help children displaced during times of unforeseen tragedies such as the earthquake in Nepal (2015), Typhoon Haiyan in the Philippines (2013), and the earthquake in Haiti (2010). As we are all unpaid volunteers, 100% of the proceeds donated through our website goes to the children in the form of food, clothing, shoes, school supplies, and/or construction of school buildings or, if so designated, to our Save The Children program which we contribute to the US Fund for UNICEF unless we are suitably positioned to provide in-field work such as we did during the famine in Cambodia, the bombings in Israel, and for the refugees fleeing Thailand during the May 2014 Thai Military Coup. We raise money separately for our administrative expense and fundraising activities whether through our Board Members’ contributions and/or corporate sponsorship. Of course, any funds that you might designate for our administrative expenses would be greatly appreciated, too. Finally, each and every one of us invite you to learn more about our foundation, become part of our family, and leave your own legacy by changing the lives of underprivileged children, their families, and their future generations to come.